Cocoa plantations in West Africa are sometimes not as productive as expected, yielding low income for farmers. To compensate and improve their livelihoods, some farmers have expanded their farms into forests. Among other factors, poor soil fertility has contributed to a decline in productivity and, although cocoa production is an essential source of livelihood for millions of farmers, the lack of knowledge on good crop nutrition and proper management of cocoa trees cannot be overemphasized. 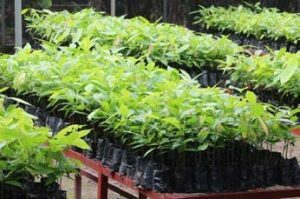 The CocoaSoils Program aims to increase cocoa yield without expanding cultivation into forested areas. The Norwegian Agency for Development Cooperation (NORAD)- funded CocoaSoils Program led by IITA and Wageningen University and Research (WUR), was created this year to address this issue. CocoaSoils engages the expertise of the World Cocoa Foundation (WCF) along with the Cocoa Research Institutes of Cameroon, Côte d’Ivoire, Ghana, and Nigeria. Also involved are international research centers such as the International Centre for Tropical Agriculture (CIAT), the World Agroforestry Centre (ICRAF), and the UN Environment World Conservation Monitoring Centre (UNEP-WCMC). The program aims to deploy an Integrated Soil Fertility Management (ISFM) approach to achieve sustainable intensification in cocoa farming across West Africa. To make appropriate ISFM recommendations for farmers, it is imperative to have a good understanding of the roles of the different soil nutrients to the cocoa trees and yield. This knowledge is not readily available, therefore, the partners of the CocoaSoils program are setting up “Core and Satellite Research for Development” trials to help provide site-specific ISFM/fertilizer recommendations across West Africa. Cocoa production is an important income earner in West Africa. The core trials are long-term trials covering at least two hectares while smaller trials (satellite trials) will be set up in farmers’ fields to test different fertilizer combinations and shade interactions to examine the effects on yield under field conditions. 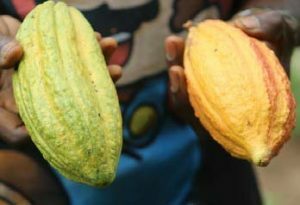 The results from these two types of trial will inform recommendations that will be delivered to farmers through a Partnership for Delivery mechanism that uses existing service delivery channels by both public and private sector partners to achieve better yields and improve sustainability of cocoa production. This should help prevent expansion of cocoa cultivation into forested areas. Trials have been confirmed in Cameroon, Côte d’Ivoire, Ghana, and Nigeria while opportunities are being explored to conduct similar trials in Ecuador, Brazil, and Indonesia. In the next five years, CocoaSoils plans to have developed ISFM recommendations to be integrated into extension messages for cocoa intensification as well as achieve a deeper understanding of the cocoa tree’s nutritional requirement.